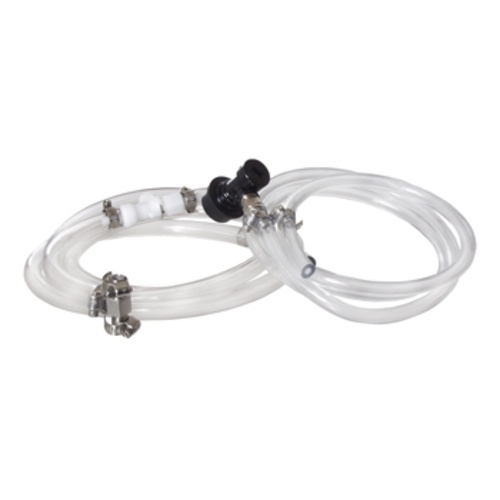 Connects your new Counter-Pressure filler to your existing ball lock kegging system with a convenient, sealing quick-disconnect system. Having everything you need all in this kit makes set-up & use of your counter-pressure filler easier. If you have the Counter-Pressure bottle filler then this set is a must have! Hardware to connect filler to gas system: Gas line tee, quick disconnect set, 6' of gas line. Hardware to connect filler to keg: Threaded, black Beverage-Out Quick Disconnect, related flare fittings, 5' of beer line. Trying to find an efficient way of bottling from a keg. How difficult is cleaning this and the associated counter pressure filler and what is the procedure? Cleaning is pretty easy, but you will ideally have a spare keg. Fill your spare keg with star-san and run it through the CP Filler for a couple minutes before connecting to the beer keg. After you've filled all your bottles, re-connect to the keg with the sanitizer and run it through. You'll also want to have a small bucket with star san while you're filling to rest the CP Filler in between bottle fills. BEST ANSWER: Hello Daniela - Instructions are on the product page. Should you require more assistance, please feel free to call us at 1-800-600-0033, we'll be happy to help. Just received my order and it came with zero instructions on how to install or if any additional pieces were needed as it seems obvious there were. Any assistance can be shared before I process a return? BEST ANSWER: This item would need to be used with one of these bottle fillers. Which Gas Side Coupler do I need to go with this if I don't want to cut my existing gas line? BEST ANSWER: You can take the "T" off the end and hook it to anything that has a 1/4" - 5/16" barb like a manifold or dual output regulator. You can try to buy everything and put it together yourself but, it's already made for you. Just buy it. A must have if you buy the counter pressure filler. Assembly is a snap! BOOM! If you get a counter pressure filler, you will probably need this kit. This is a great product. You can't beat the price or make one on your own for cheaper. This works so great to quickly clean a spent keg and have it ready for the next fill. Saves a lot of hunting around for parts. Bought this based on the expectation it would save me a trip to the hardware store. Unfortunately, that didn't turn out to be the case- I still had to make a trip for 2 hose clamps in order to insert the tee on my CO2 line. Not a big deal, but a minor inconvenience. Otherwise, all very good quality and it does include the right kinds of lines and other parts needed that would be kind of a pain to track down yourself. Like everybody else said, why waste your time in the hardware store? You're already ordering the filler, get the fittings and hoses all ready to go and a perfect fit for your setup. If you have the counter pressure bottle filler, get this setup. It makes using the filler a snap. Makes sure that you get everything that you need. No issues after many uses. I could have figured out what I needed and tried to build it myself, but I hate missing one piece and having to wait before i can complete it. This allowed me to clean the bottle filler and lines, and go right to bottling. This group of items proved to be much easier than figuring out the pieces I need to make the pressure filler work. But you pay a little more for the convenience, as you would expect. The most convenient feature is the quick connect in the gas line. I connected it straight to the manifold in my Keezer and now have a permanent hook up with a shut off valve and quick connect for easy use, instead of splitting the gas line off of the tank. Get this with your counter pressure filler. While you could go to the hardware store and piece together something that would get you by, this set up is eexcelent and worth the money. They really should just send this with every filler. this is a must for your set up... GET IT! If you already have the counter-pressure bottle filler, just get this, too. Otherwise you'll just be wasting your time at the hardware store trying to find all the pieces you to need to, well, build this kit. This is nice to have if you don't already have a bunch of gas/beer lines already and the quick disconnect is very nice for switching things out. You need all of these parts for the filler anyways, might as well buy them put together. This is useful if you are like me and you would rather buy something put together than try to piece something together yourself. Works well with the counter pressure bottle filler. you really need to have this to make filling easy when using the counter pressure filler. Make everything work easier while filling.